We now have a single rider that has stepped up and reeled off a few wins. No, he hasn’t completely dominated yet, but he’s looked pretty darn good so far. That, to me, is good as a fan because nobody loves a boring race. Cooper Webb is the guy I was just talking about. He has found his groove early and looks hard to beat. Right behind Cooper is Ken Roczen. Ken has rebounded from two of the worst arm injuries ever seen in this sport, so for him to be the points leader is pretty amazing. Heck, it is a victory in itself to see Ken back on the bike. Like I keep saying, this year’s 450 class is very stacked inside the top 10. There are many riders capable of podiums and wins, and I’m willing to bet that we see many more fresh faces before Vegas. Here is a look at Saturday night’s results and my thoughts. 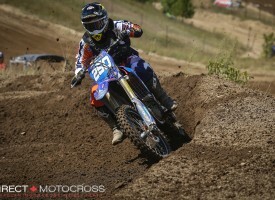 1st #2 Cooper Webb: All aboard the Cooper Train! Webb is looking like the dominant rider he was just a few years ago. He looks like he could be a factor in this championship right until the end. It’s amazing what confidence can do, and I’m sure the new KTM ride and Baker’s Factory has something to do with it as well. 2nd #94 Ken Roczen: Ken is riding super consistent, and that is great, but, he’s gonna need to hang it out to get that first win. Once he gets the win, it will be much much easier. He also reclaimed the red plate, which looks so darn good on that Factory Honda. 3rd #25 Marvin Musquin: Marvin looked super sketchy at times in the night show, but rebounded very well in the main. It’s just a little scary how easy he gets rattled, and how long it takes him to settle down. 4th #17 Joey Savatgy: Wow, Joey looked really good. He doesn’t have 20 minutes in him yet, but that will come. He got a taste of the pace required to win, and not a lot of guys have that yet. This ride will push Joey to the next level. 5th #10 Justin Brayton: Nice ride for Brayton, especially dealing with a bad thumb. I think if he has success in his heats, the confidence carries over making him dangerous in the mains. 6th #3 Eli Tomac: This year is different for Eli. He can’t start way back and get a win. For starters, the class is too stacked, and add in the fact that the others know that he’s beatable now. I still think he’s playing it a little safe, and that is a good thing. He’s still in this title fight, as you can never count out his raw speed. 7th #22 Chad Reed: Great ride for Chad. I’m just pumped to see him out there racing again and not trying to ride himself into shape. He still looks great, but maybe needs to get a little out of control and have some fun. 8th #15 Dean Wilson: Dean moved back to the Factory team this week. The bike remains pretty similar, it’s just quite a bit easier for Deano to be riding worry free out of the semi. I think with time he will get closer to the top 5, his starts need help though. 9th #51 Justin Barcia: Justin seems a bit off as of late. His starts just aren’t there, and this class is too deep to start outside of the top 10 and go on a passing spree. If the starts come back, I’m pretty sure that the podiums will too. 10th #7 Aaron Plessinger: These are the rides Aaron needs, and he will build some confidence and get better as the season goes on. He’s still looking a little timid out there and not showing us the fearlessness he had on a 250f. It’s understandable, but sometimes you need to go balls out and show yourself that you can do it. Biggest Stud: I’m going to call both Webb and Roczen my studs. Cooper is hot right now, but Ken has been super confident and consistent. I feel these two will take it right to Vegas going back and forth. Biggest Dud: I didn’t really see a dud this week, maybe I’m getting soft? Biggest Surprise: Joey Savatgy surprised everyone. You are lying if you thought he’d be the top qualifier this early in his 450 career. MC’s ‘G’d Up from the Feet Up‘ Award: I was digging Plessenger’s Thor Kit. It just looked fun. The big green monster logo took away from it, but it still looked good.